Airbus Helicopters has signed an agreement with Singapore Post (SingPost) under which SingPost will become its logistics partner for its Skyways parcel delivery project. 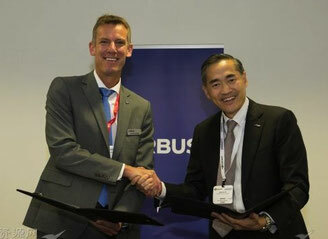 The MoU was signed at the inaugural Rotorcraft Asia exhibition which took place in Singapore earlier this month by Jean-Brice Dumont, Airbus Helicopters' executive vice president of Engineering and chief technical officer, and SingPost's Covering Group CEO, Mervyn Lim. Skyways aims to develop a safe and economically viable parcel delivery system by drones for use in urban environments. The research and development phase is now at an advanced stage, with an initial trial phase planned at the campus of the National University of Singapore (NUS) by early 2018. Airbus Helicopters is the overall Skyways system architect and provider, contributing its capabilities in drone platforms as well as its concept of future parcel delivery. As the logistics partner in the project, SingPost will bring its expertise in software systems that control and manage delivery networks, customer-interface systems and real-time back-end links to a delivery system that serve the last mile. SingPost will also contribute its understanding of postal and eCommerce logistics trends to ensure the solutions developed will address the future logistics needs of cities around the world. "Our trial will involve SingPost's parcel locker technology, and this MoU fits well into our long-term plans to develop future generations of parcel delivery points that involve drones and the vertical dimension," said Mr Lim.